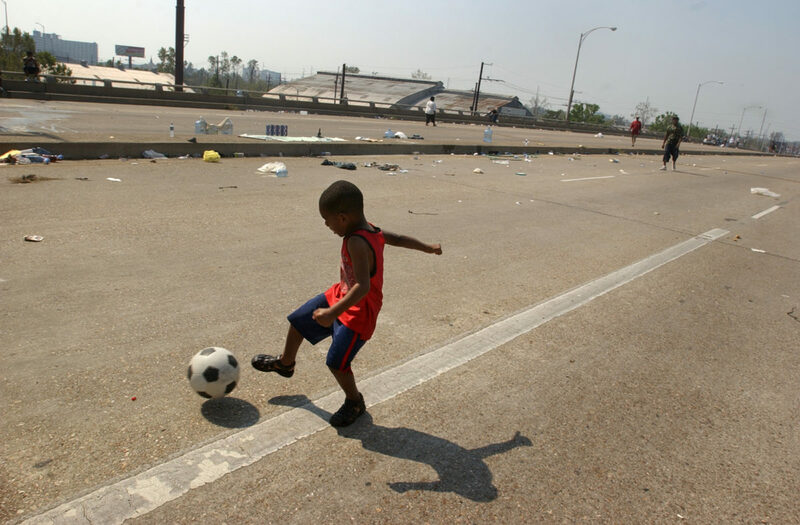 A bottle of water floats near a body in floodwater under the interstate around the Superdome as waves pass by caused by military trucks in New Orleans on Friday September 2, 2005. 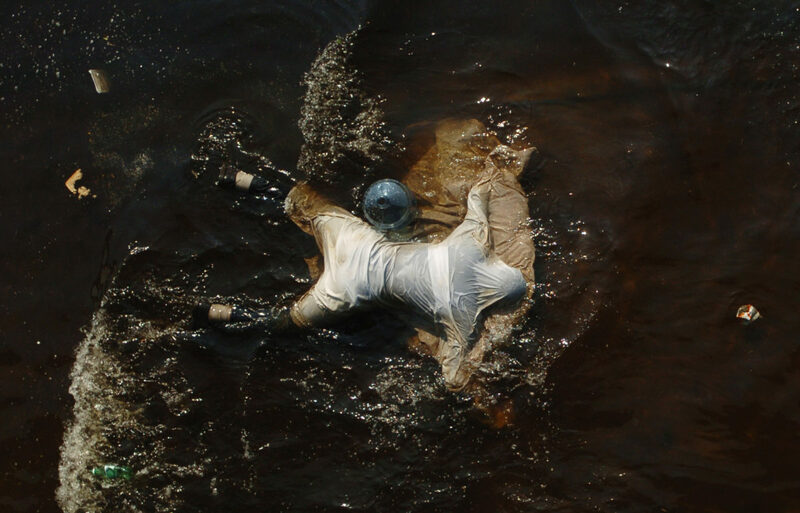 A man stretches his arms, calling for rescue in Uptown New Orleans on September 3, 2015. 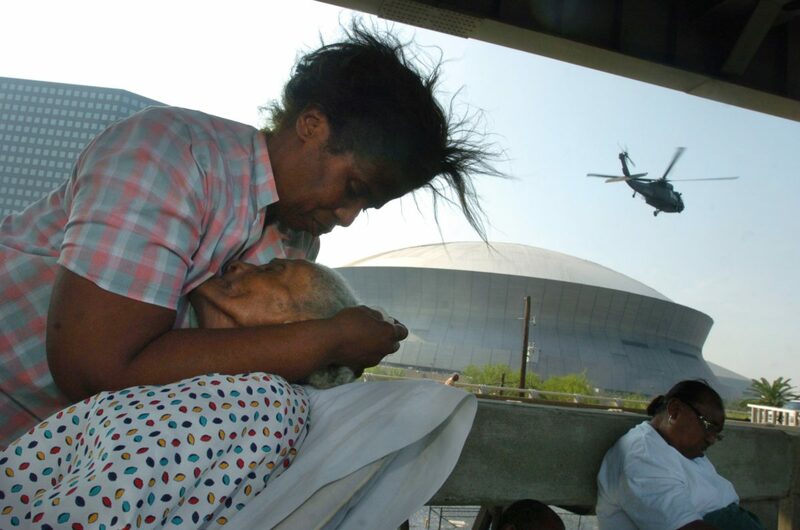 Ann-Veronica Recasner, tries to shield her mother, 90 year old Mildred Foley from the blasting wind caused by a landing chopper at the Superdome as they camp on the interstate in New Orleans on Friday September 2, 2005. 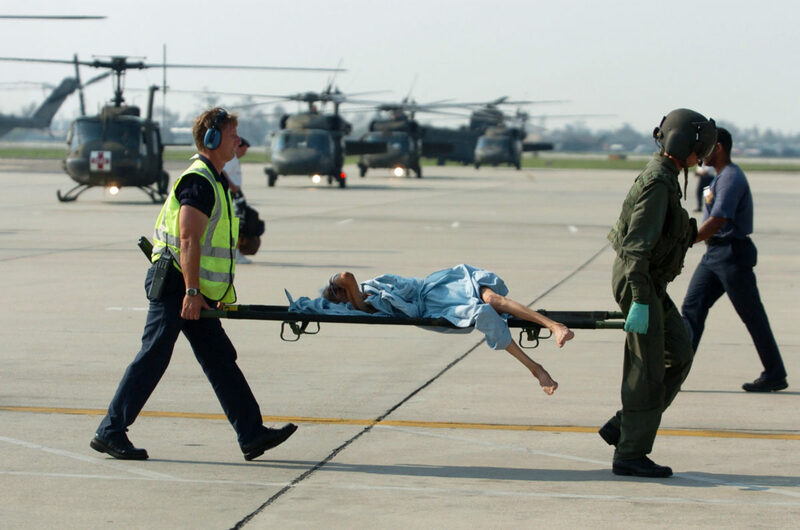 She was dying of dehydration," Ann-Veronica said. "She seems to be a little better." 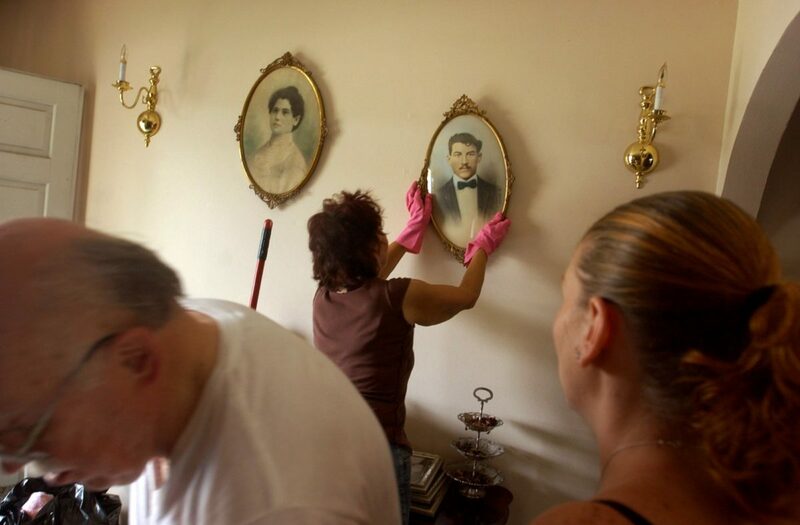 June Clesi fixes a photo on the wall of her grandparents who immigrated from Italy, Katherine Clesi and her husband Antonio Clesi at their home in Metarie in Jefferson Parish on Monday September 5, 2005. "I can't replace those two," she said of the photos. 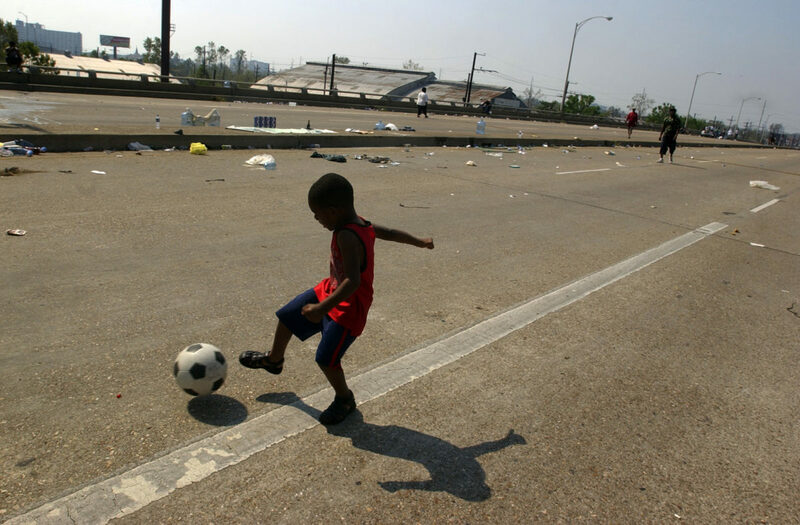 Residents were allowed entrance to Jefferson Parish on Monday. 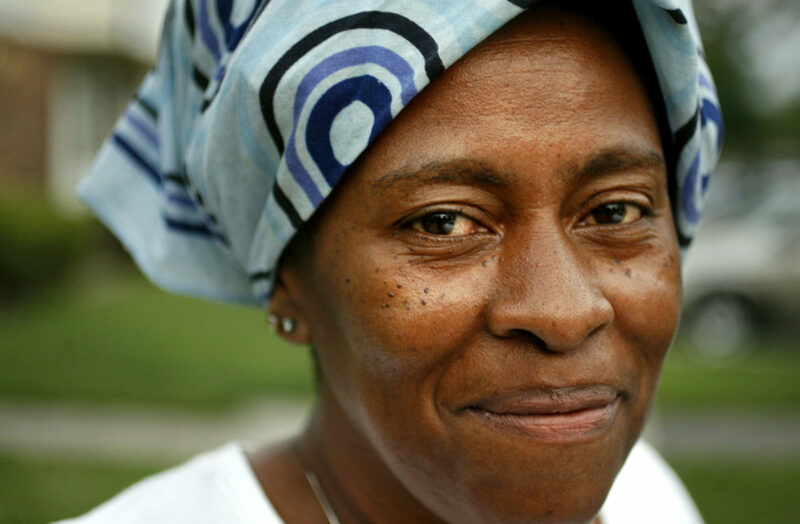 June came back to her house after spending the last week with her family in La Place in a home with 17 other people. 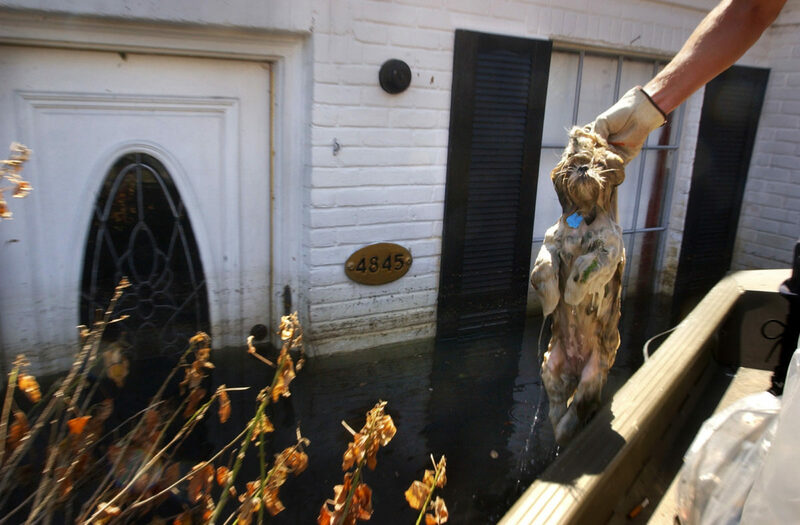 A dog is pulled from the flood water after it was seen paddling near a home in New Orleans East after the levees broke in New Orleans following Hurricane Katrina's landfall in Mississippi. 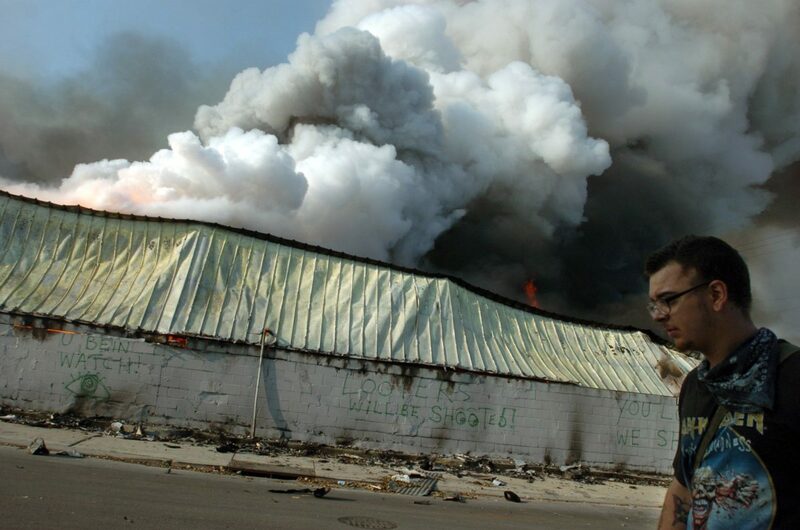 Jake Weber, 25, walks next to a burning chemical storage facility in the Marigny in New Orleans on Friday September 2, 2005. "It sounded like 10 people were banging on (the window)" he said of the explosions he heard the night before. 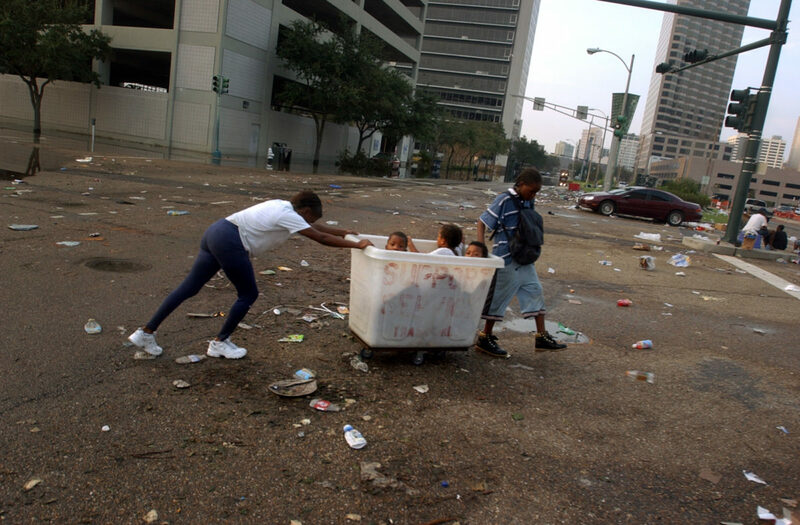 Evangela Youngblood, 35, left pushes a cart filled with her cousins and niece while Michael Youngblood, 12, her nephew pulls from the other side on Julia Street in New Orleans on Thursday September 1, 2005. "We're going to have to start walking to Baton Rouge in the morning," she said. "I seen children drop dead at the convention center." She said she isn't interested in waiting for a bus that may or may not come around. 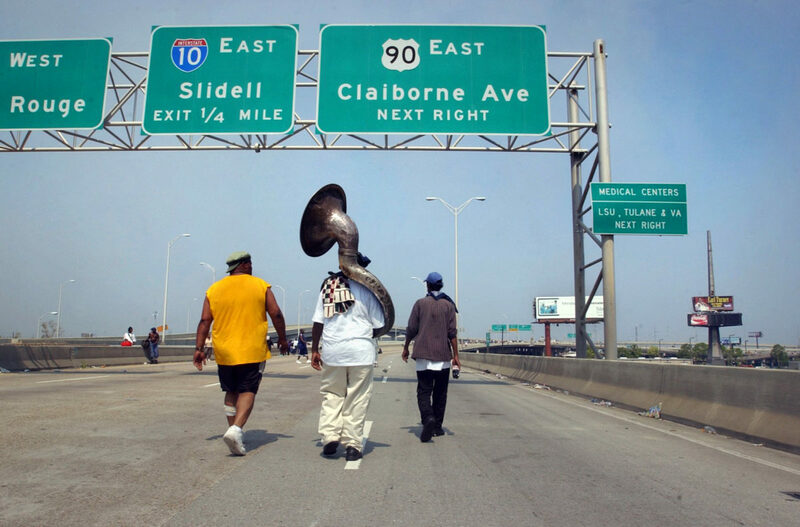 Mark Smith, middle, walks to an area where he's planning to camp out carrying his sousaphone on the interstate next to the Superdome in New Orleans on September 2, 2005. "If I leave this I might as well jump in the water myself," he said of his instrument. "This is my livelihood." 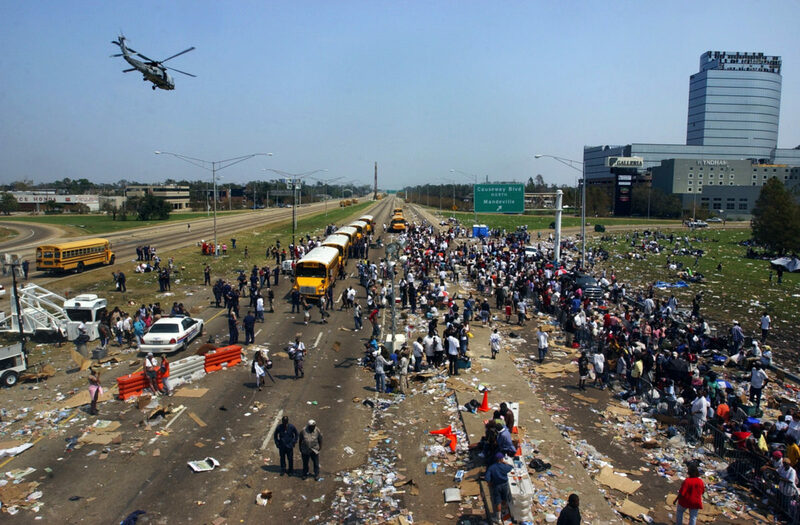 Hurricane Katrina made landfall in Mississippi on August 29, 2005. 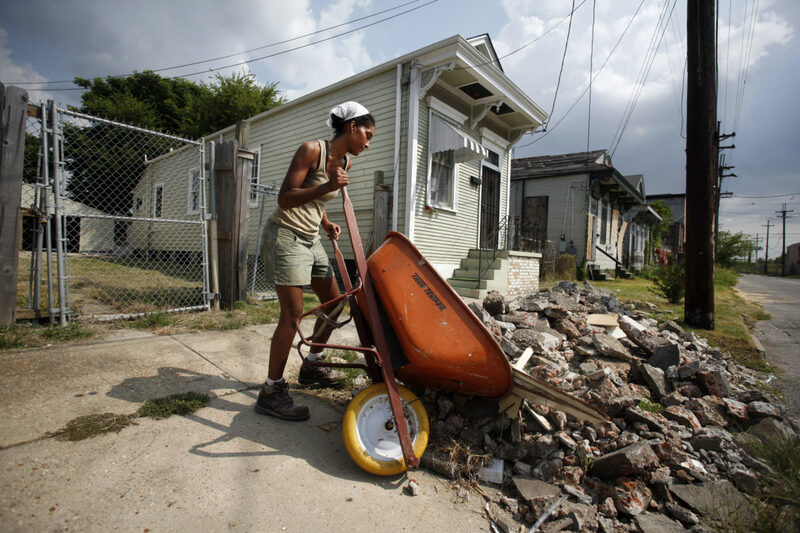 Levee breaches in New Orleans led to massive flooding, and government response was slow. 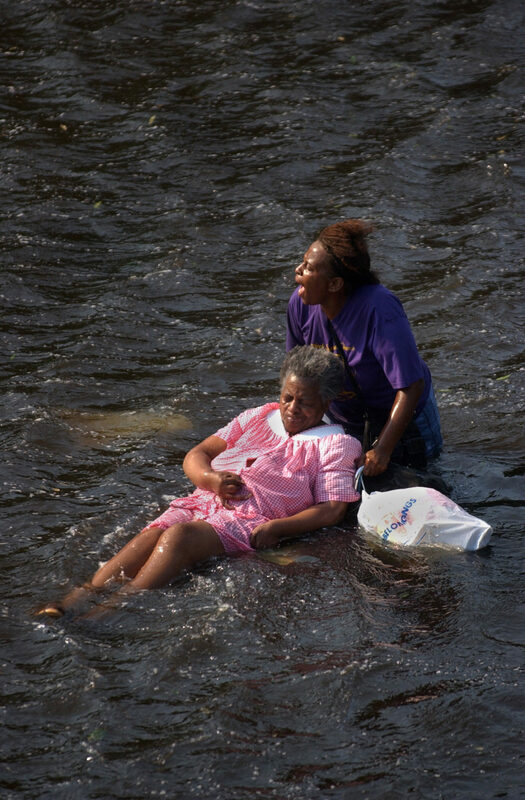 Hundreds of thousands of people in Louisiana, Mississippi and Alabama were displaced from their homes, and there were 1,836 fatalities, primarily from Louisiana (1,577) and Mississippi (238). Over fifty breaches in the levee system were the cause of the majority of the death and destruction. Eventually, 80% of the city and large areas nearby became flooded, with some of the water remaining for weeks. 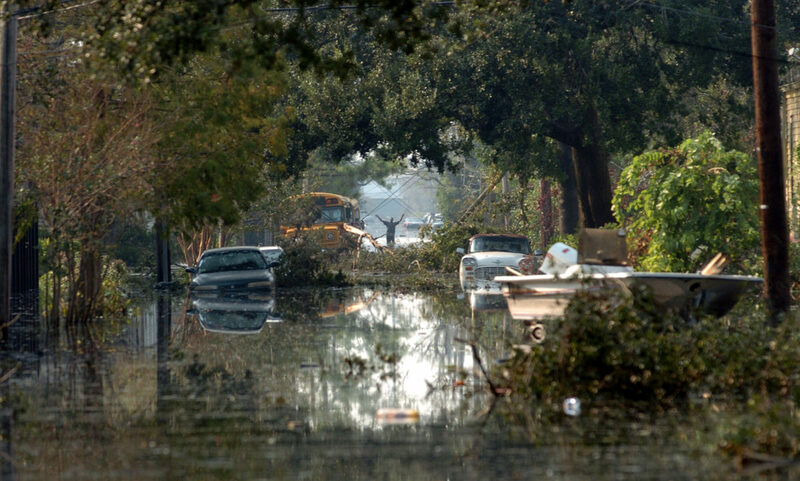 The hurricane displaced over one million people from the central Gulf coast making it the largest diasporain the history of the United States.